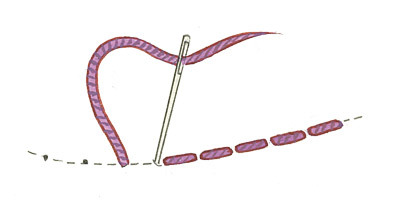 When doing back stitch, stitches are sewn backwards to the direction of the sewing. They are usually used to outline shapes or add detail to an embroidered picture. For instance, they were used to outline the facial features on the faces above. Backstitch is perfect for beginners as you get quick results, and it’s very hard to get muddled with one straight line of sewing. We think back stitch is one of the best embroidery stitches, giving quick and neat results without too much fuss. In fact, thanks to its adaptability you can make pretty much any shape from backstitch, meaning you can use it to illustrate everything and anything! It’s one of our favourites, and once you’ve mastered it we’re sure you’ll agree that you love it too! So, why not find yourself a needle and thread and have a go at some back stitch. To do backstitch, work from right to left, putting your needle into fabric, as shown, and bring it out at the first dot below. Then again, put needle into fabric beside your stitch and bring it out at second dot below. It really is that simple. We did tell you! If you’ve made something you’re proud of, using back stitch, then we’d love to see it! You can send us a picture via this simple form. We read every single one of them and really do love seeing what our readers have been making, we think you’re an awfully clever bunch. From time to time we like to feature your work on our website, or on our Facebook page. You never know if yours might appear, so keep your eyes peeled!